Ten years after its official global launch, the Montecristo Edmundo is indeed a phenomenal cigar harking back to the glory days of Montecristo from the 1950s and 1960s. The current release shows the same richness and finesse of Montecristos that were made from tobacco aged for an extended time in cedar rooms before blending and rolling. Cigar collectors still pay hundreds of dollars a stick for such cigars! But forget that. We are amazed by the current production. That’s why our Cuban Cigar of 2014 is the Montecristo Edmundo. That’s why we rated it 99 points. 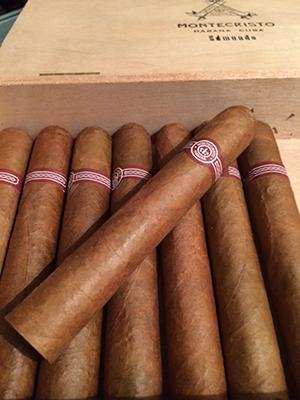 We believed in the Montecristo Edmundo back in 2004 when we first tasted the thick cigar measuring 52-ring gauge by about 5 3/8 inches long in Cuba. We were at the launch in Milan and we noted how fascinating the smoke was. We have been buying it ever since. 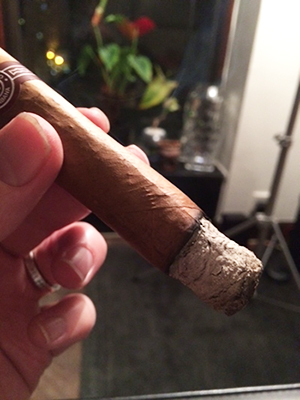 The box of Montecristo Edmundos we bought in Hong Kong this year with JAN 2014 printed on the back was amazing quality! Each cigar we have smoked from the cedar box over the last three months is superb quality – 98 points. And we have smoked the Edmundo against dozens of similar sizes from Partagás Serie D No. 4 to Hoyo de Monterrey Epicure No. 2. Edmundo crushes them! The white ash of the Edmundo shows that they have wonderfully aged tobacco and a blend that offers balance and richness. They are full-bodied with cedar, spice and light coffee – hints of walnuts and strong black tea too. They deliver a soft and round texture with brightness and freshness. The palate remains fresh and moist with a clean and subtle tobacco aftertaste. They are cigars to enjoy smoking now but will improve for many years to come. They are altogether intense smokes with a mellow and satisfying finish. Everyone with an interest in Cuban cigars, not to mention true aficionados, should try a Montecristco Edmundo. You will quickly understand why Cuba still makes the greatest and most unique cigars on earth.